Responsive web design (RWD) has been around since 2004, and actively used since 2008. It was born out of a dual need to create a better experience for internet users, specifically on mobiles and tablets. Simply put, RWD is an approach to site design that ensures optimal display and function across multiple devices. Essentially this means that the user has a seamless experience, whether accessing from a desktop or tablet, and in turn, the site owner can evaluate the data more easily, as they are dealing with one version only. - Fluidity; the grids used on RWD page are elastic, enabling them to flex to fit the content, regardless of a screen size. Images displayed are not set in pixels or points, but percentages, enabling a liquid-like feel to the design. - Media queries allow the page to use different CSS style rules based on the device being used. Why use responsive web design and what are the key benefits to your business? There are clear benefits to using RWD from both user’s and site owner’s perspective. Users no longer desire to see the exact same look and feel across devices when viewing the same website, but instead crave for a better user experience. In an internet age where 'content is a king' and we are defined by the content we share, if a site has great content, but the user experience is poor, this will drastically affect the rate of sharing. MTV increased their website traffic by 92% with a RWD! This is demonstrated by a recent MTV case study whereby mobile traffic increased by 92%, time per visit increased by 297% and social referrals increased by 246% when their site was given a responsive redesign. The link between UX and content is clear here. 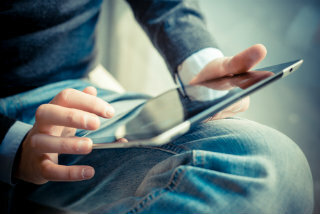 If the user finds the site engaging and easy to navigate on their chosen device, the propensity to share is increased. RWD doesn't only benefit the user, however. Jody Resnick, President of Trighton Interactive, stated in an interview with Forbes Magazine that "Responsive websites simplify internet marketing and SEO. Instead of having to develop and manage content for multiple websites, businesses with responsive sites can take a unified approach to content management because they have only the one responsive site to manage." If you would like to build a new website or re-design an existing one Kommand.me team is here to help! We offer a number of web design packages from as little as £9 a month; all of the templates are mobile responsive and SEO friendly. Kommand.me platform is very flexible and can be used without any programming knowledge. Simply choose a package and start building your website today! If you need any help our team of web designers can give you advice or for a small fee build a website for you. We are here to listen to your needs and help you achieve your goals. Contact us and get your new website today!